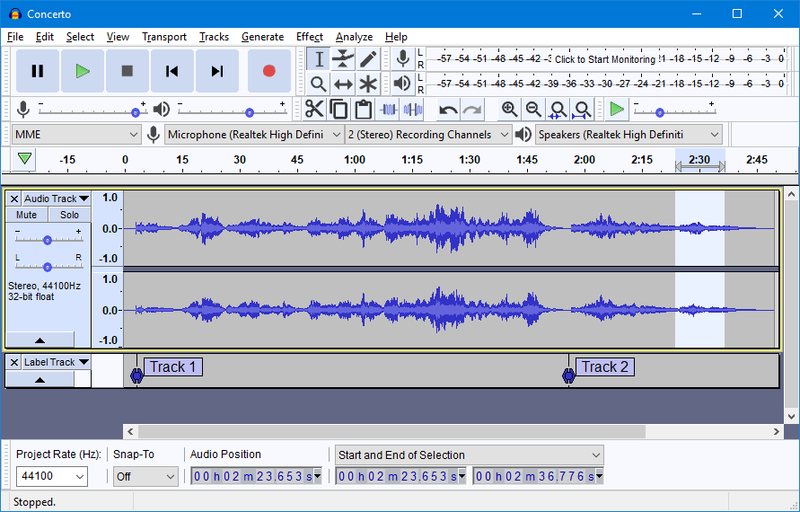 Audacity is a free, easy-to-use, multi-track audio editor and recorder. The interface is translated into many languages. Audacity 2.3.0 was released on 29 September 2018. Audacity 2.3.0 replaces all previous versions. Over 90 bugs fixed since 2.2.2. Includes fixes to Timer Record, and to 'Envelope Points'. Macros (formerly 'Chains') substantially extended. Pinned-play-head can now be repositioned by dragging. Timer record continues recording and does not stop at the stated time. You may on low powered hardware still see slow updates to the timer, and we haven't fixed that entirely yet. QM 1.7.1 plug-in crash, now fixed. Envelope curves got badly confused when joining clips. "The Incredible Shrinking Toolbars" - Toolbars getting smaller if you repeatedly docked and undocked them. 4,690 8,037 Audacity <img src="https://www.oldergeeks.com/downloads/gallery/thumbs/audacity-windows_th.png"border="0"> Oct 01, 2018 - 11:08 2.3.0 25.46MB EXE , out of 16 Votes.